This series of articles explores various tools for executing pipeline as code and deployment. The goal for each article remains the same: check out GIT source code, compile a JAVA project with Maven, run the tests and then deploy the application on AWS BeanStalk. These steps will be written as code in a pipeline and executed with a CI/CD tool. Before starting, let’s define two key concepts: continuous deployment and pipeline as code. With low-risk releases, you can quickly adapt to business requirements and user needs. This allows for greater collaboration between ops and delivery, fuelling real change within your organization and turning your release process into a business advantage. Pipeline as code defines the deployment pipeline through code instead of configuring a running CI/CD tool. 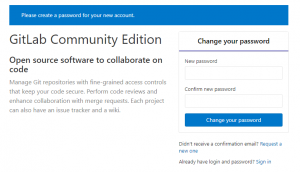 GitLab is the next target for our third article. You’ll find the first, second article by clicking here: #1-Jenkins, #2-Concourse. GitLab is a suite of tools used to manage the complete development of an application. It integrates the entire DevOps development and delivery cycle of an application. This suite is truly impressive in its coverage, the quality of its tools and the complete integration of each feature. This article will present the pipeline section. The GitLab pipeline function works as a YAML description. The configuration is stored in the project. The pipeline is triggered when a source code is changed on a branch, whether it is a change in the source content or the pipeline itself. Since everything is integrated within the project and its branches, the source code checkout is implicit when running the pipeline. A pipeline is composed of internships and tasks: internships are phases of the pipeline such as “Build” or “Deploy”. Tasks are associated with internships and are run in parallel for each internship. Tasks are mainly script executions and invoke Dockers to execute the operations. Several elements are available in tasks to be realized. Documentation is available at this location. Then log in by changing the password and log in with the root account according to following instructions. The prerequisite for using the GitLab pipeline is to create a project. 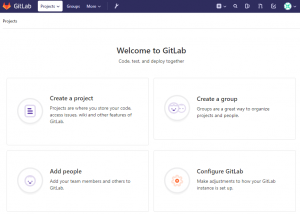 A project can easily be created by following the instructions on the GitLab home page, as shown in the overview below. Once your project has been created, you must add the source code by following the GIT instructions on the project page. 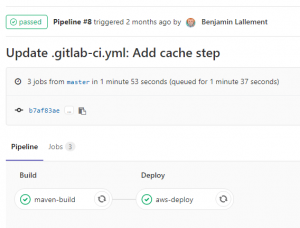 A GitLab Runner allows you to perform pipeline tasks. At least one Runner is required in addition to installing GitLab. A Runner is easy to execute as indicated in the installation and registration documentation. Once the Runner is available, it is possible to run an application’s pipeline! GitLab uses pipelines in declarative form, unlike scripting pipelines (see Jenkinsfile). Mastering this format requires a substantial learning curve. GitLab’s excellent documentation is extremely helpful in beginning the learning process. 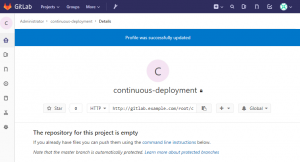 - eb init continuous-deployment-demo -p "64bit Amazon Linux 2017.09 v2.6.4 running Java 8" --region "ca-central-1"
As soon as the .gitlab.yml file is added to the project, the pipeline view becomes available via the menu, or by adding /pipelines after the project address. 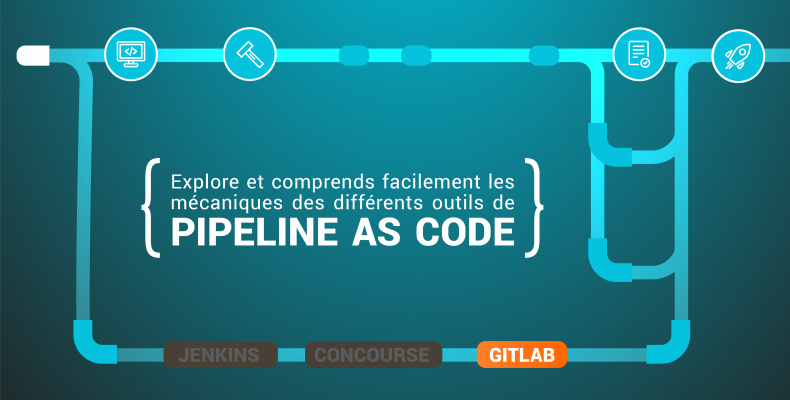 The pipeline (.gitlab.yml) is defined. With each code change, the steps and stages are triggered to compile, store in the pipeline’s working folder, and deploy to AWS. Thanks to its integration, changes to the source code are visible in the detailed view of the pipeline and, conversely, pipeline executions are visible in the source code change view. This integration facilitates branch status navigation and validation. GitLab offers a complete suite for managing an application’s DevOps cycle. GitLab offers complete and intuitive integration for all features. Pipeline execution of merge-request is triggered automatically. GitLab does not offer a CLI to test pipeline execution. One must “commit” the pipeline to see it running, which can lead to much trial and error. Substantial learning time is required to master the declarative pipeline YAML syntax and use it without error.